The website Walk Score has just gotten even more valuable. You may be familiar with the website already. Until now it has helped people find housing within easy walking distance of various amenities, such as parks, cafes and grocery stores. More recently it added a “Transit Score” feature that shows which neighborhoods have high quality transit access — or none at all — and everything in between. This week it launched a beta version of a feature that’s kind of like the inverse of Transit Score called Apartment Search. With Apartment Search, you can input the address of your workplace, the time you’re willing to spend commuting and your mode of choice — car, transit, bike or walking — and it will instantly generate a map showing all the apartments in that geographical area. Another handy feature is that it’s possible to filter the results by Walk Score. So in effect you can say: “I want live in a ‘very walkable’ neighborhood that’s a 15 minute bus ride from my job,” and Apartment Search will show you a map depicting all the listings that meet those criteria. On the face, this looks to be another excellent tool for helping people make informed decisions about where to live and work. In particular, it makes it really easy to directly compare transportation options in a given city — even if it doesn’t tell you about the cost of each mode of transportation. Now that I’ve praised the concept, it’s time to check how it works in practice. To see if it passes the smell test, I thought I’d check the Apartment Search guide for my current “workplace,” UCLA, and see if it placed my southeast Santa Monica apartment within a 45-minute bike ride. Not only did it suggest that I fall within 45 minutes — the time it typically takes to bike the 4.5 miles up to campus — it said I was I actually within a 30 minute ride. Apartment Search suggests that the highlighted area is all within a 30 minute bike ride. 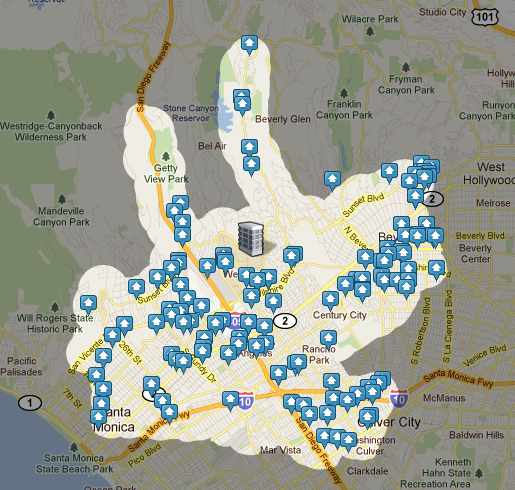 The blue icons represent available apartments. Maybe Apartment Search is making flattering assumptions about my physical fitness, but I suspect it may be underestimating two factors: 1) Westside traffic often makes it difficult to bike as fast as I could do so comfortably, and 2) It’s a steady uphill climb to Westwood that makes the trip to campus a lot slower and sweatier than the trip back home. Digging in a little further, I found another head-scratcher. The application suggests it’s possible to get from Ventura Boulevard and White Oak Avenue in the San Fernando Valley to UCLA in 45 minutes. Google Maps, on the other hand, suggests that will take over an hour during the morning rush via the 750 Rapid and the 761 Rapid. Those critiques aside, this looks to be a helpful website in the apartment hunting toolkit, especially if it helps drive home — pun intended — to Angelenos that driving is hardly the only way to get to the daily grind. And in some neighborhoods, transit, biking and walking are going to be very competitive options when it comes to time and money. I urge you to check it out yourself and let us know how it worked for you in the comments. For another take on Apartment Search, here’s a write-up from the blog Tech Crunch. I plan on using this tool, there is something about apartments in walkable environments that help to pay for themselves. Apartments in far flung suburbs are no longer feasible or worth it. With rents as high as they are or going higher, people will look towards “walkability” as a feature. I would love to see more construction of Mixed development around the Metro Stations. My main worry is there will not be enough when i finally get my own place. They should create a reverse tool for employers that shows how office location affects the ability to attract employees who live in high quality, walkable places. A “commute shed” of sorts. No joke! When I ride to campus, I take Ohio. You never really notice in a car what a climb that is, but you sure do on bike.